Vacation rental house. 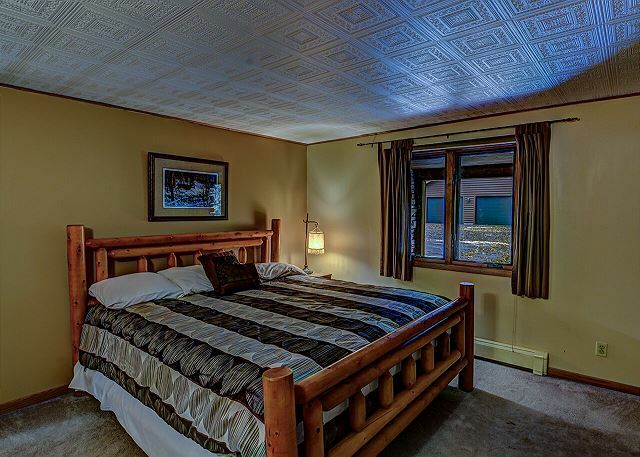 Sleeps 16, 5 bedrooms, 4 bathrooms. Dogs allowed. With a fireplace, spa, 5 bedrooms, 4 bathrooms and a huge lawn leading to sand/rock frontage. 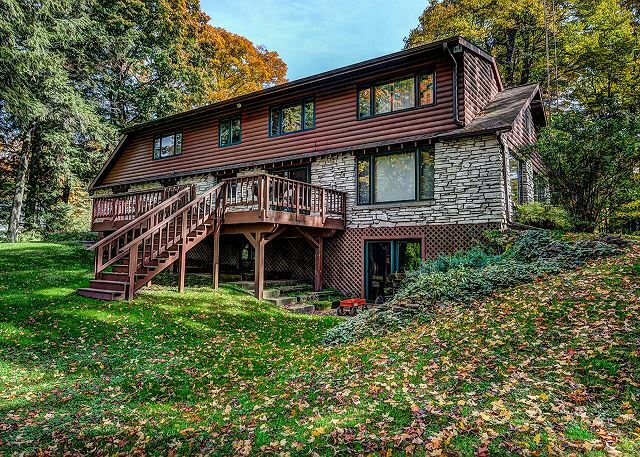 This house is known for its million dollar views! 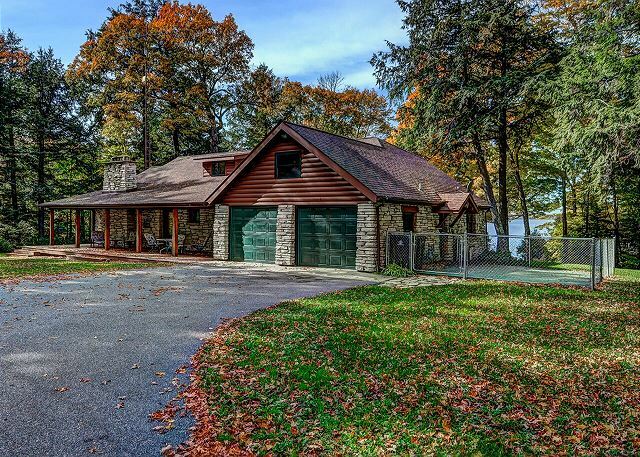 As you drive up the blacktop driveway you will see an attached two car garage. It has been converted into a large mudroom with a carpeted 1/2 car garage, perfect for your outdoor gear. 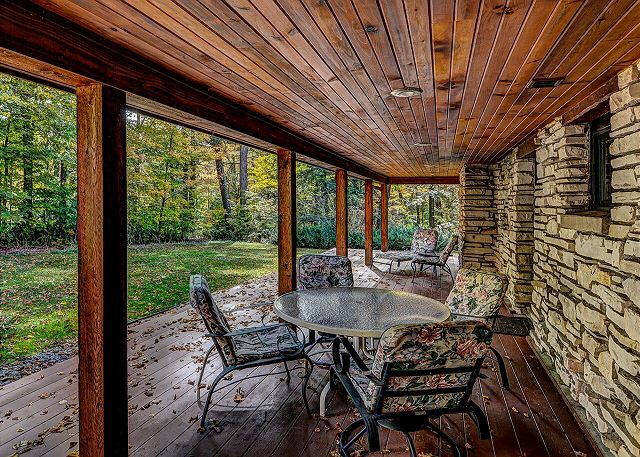 Next to the garage doors is a large covered porch which is the perfect spot to spend time on a rainy day. There are 2 large bedrooms on the main floor. 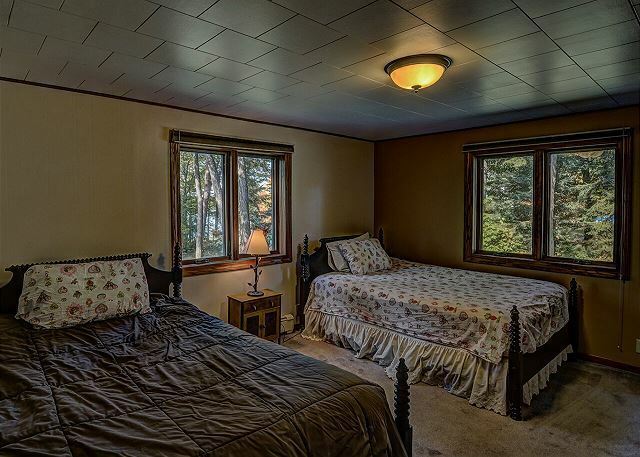 One has lake views and is furnished with a 2 full sized beds. 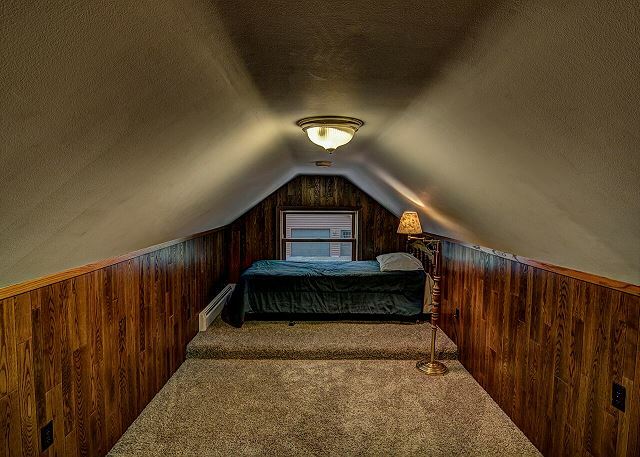 The other bedroom has a log king bed and a private bath with shower. 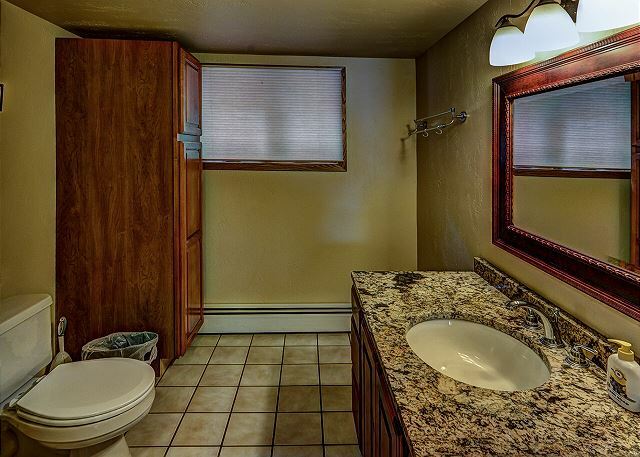 The other bathroom on the main floor has a shower/tub combo and double sink vanity. The kitchen is outfitted for your convenience. 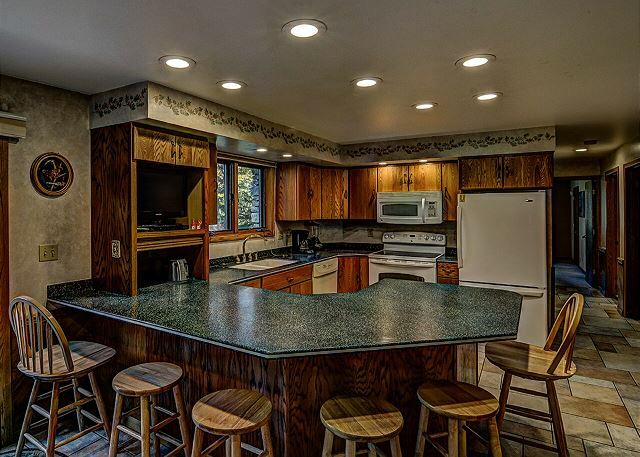 There is a large peninsula with 6 stools and a TV connected to DirecTV (we get every channel).The kitchen leads to sliding doors onto the large deck. We have outdoor furniture including a table that easily accommodates 8 for dinner. The great room is huge. 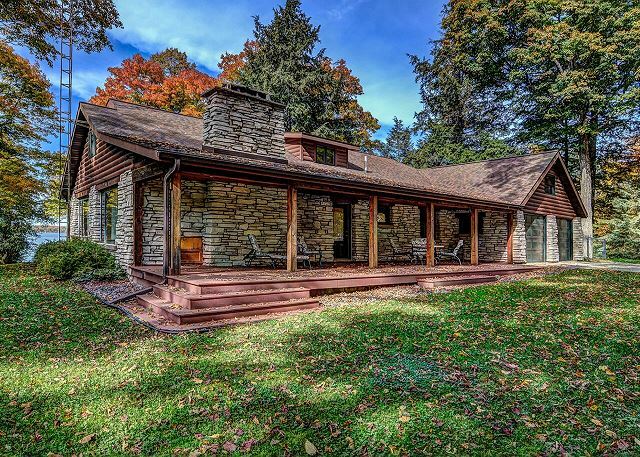 There is a large limestone fireplace on one side and 3 picture windows around the exterior. 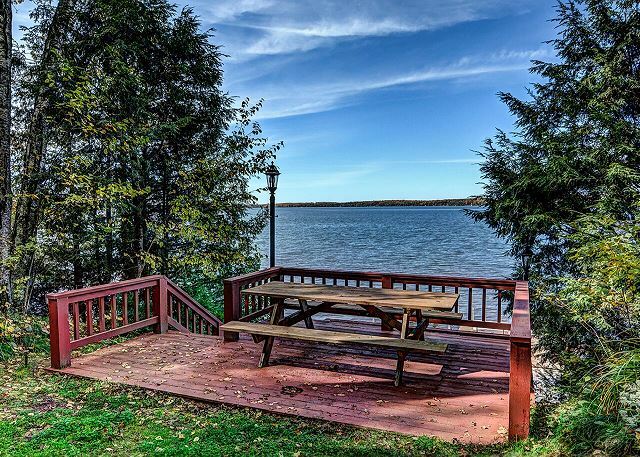 Like most rooms, the lake views are breathtaking. There is a 54 inch LCD TV hooked up to DirecTV with surround sound and a blu ray player. 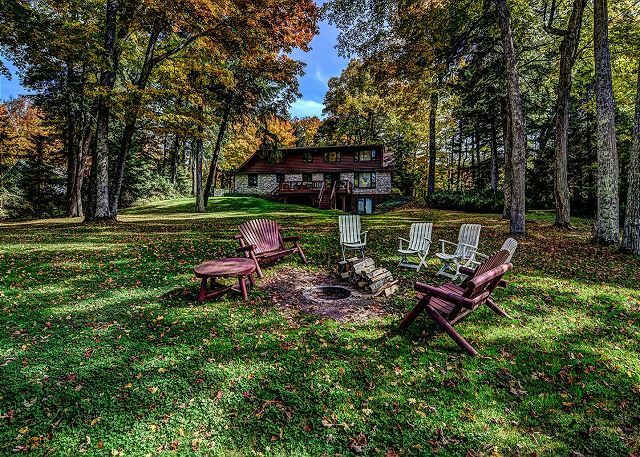 Relax on the couch in front of the fire or play games at the dining table (easily seats 10) overlooking the lake. 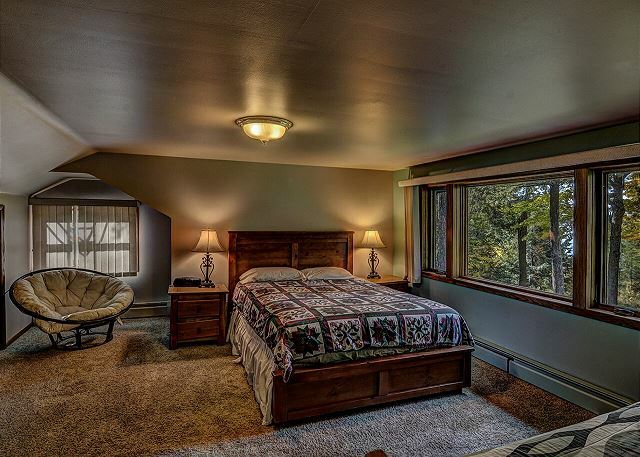 There are 3 more bedrooms upstairs with 1 queen and a daybed, 1 queen, and 1 long twin bed. The upstairs also has a bathroom with a shower and a sitting room with the best views in the house. The walkout basement leads right onto the lawn from a large rec room outfitted with a pub table, stereo system and pool table. 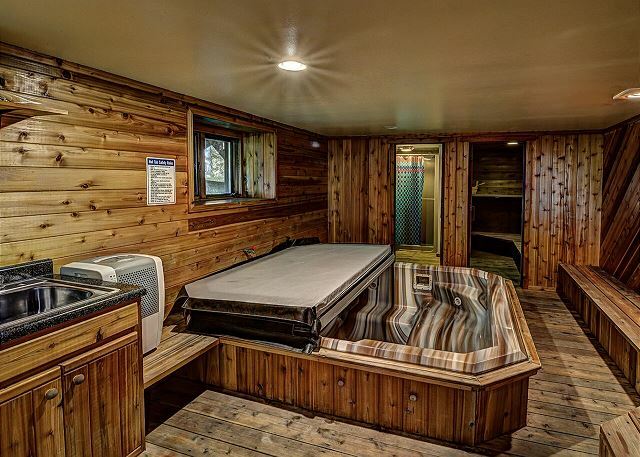 Off of the rec room is a wet bar and spa room completed with rough cedar, a large hot tub, sauna and the 4th bathroom.There is a large carpeted playroom that can be used to sleep additional guests. 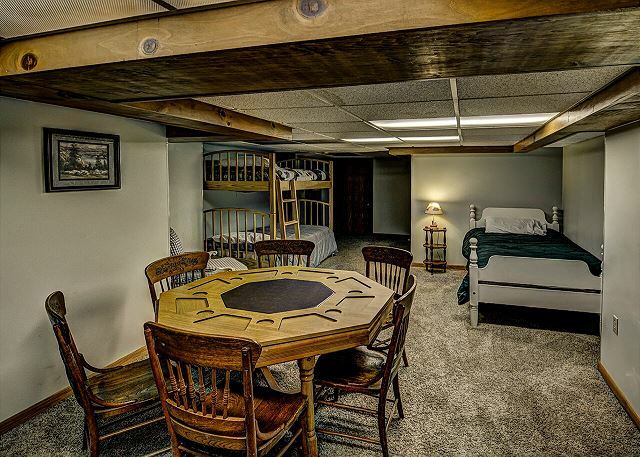 This room has a poker/bumper pool table and a twin bed and a bunk bed (twin/twin). There is also a tournament grade foosball table down here. It is a great escape for kids, our boys LOVED IT! The lawn is huge with lush grass down to a three tier deck system at the lake. We have a portable fire pit on the deck (campfire wood is there for you) with some outdoor seating. There is power and light on the decks and a newer aluminum pier on 2700 acre North Twin overlooking beautiful clearwater. The frontage is sand with lake rock at the shore. We love swimming and enjoying the sun and everyone wants to fish on Twin! Direct Tv with ALL the Movie channels.